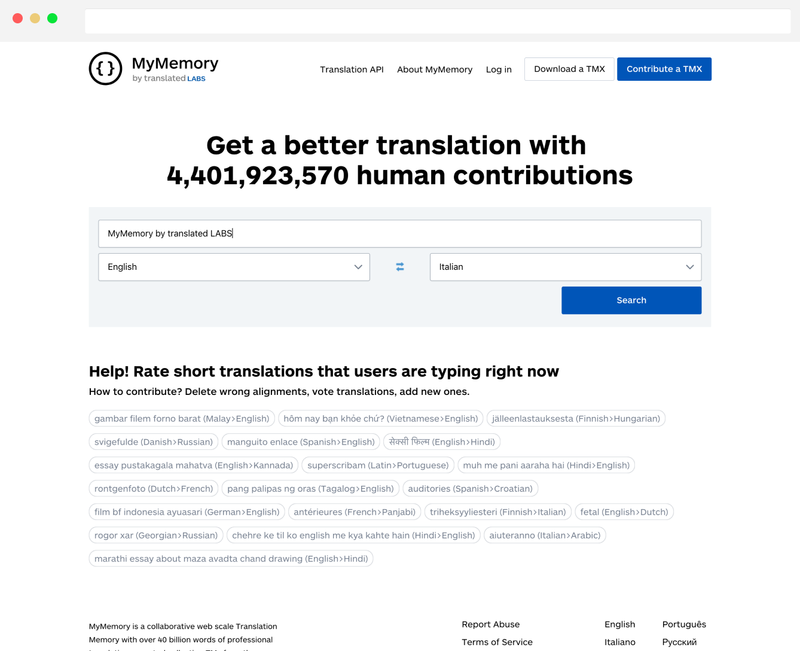 MyMemory is the world's largest Translation Memory. It has been created collecting translation memories from the European Union and United Nations, and aligning the best domain-specific multilingual websites. You can download translation memories in TMX format and use them with your CAT tool of choice, or you can also contribute to make MyMemory even better with your memories, or by editing entries. When no human translation is found for your sentences, MyMemory will help you with state-of-the-art Machine Translation technology. MateCat is a Computer-Assisted Translation tool for professionals that combines collaborative translation memories, linguistic QA, and neural adaptive machine translation. ModernMT is our neural adaptive machine translation designed for professionals. MMT has ranked at the top in scientific competitions such as WMT18. MateCat Filters convert XLIFF files and vice versa without losing any formatting. It currently supports 71 file formats, including Google Drive.